October has been a productive month to say the least. I’ve been getting back into a routine, juggling my studies, social life and work life with great difficulty. I’ve also been a little unwell during the month so healthy eating and fitness has been a little slower (had a week off to recover and start to control my asthma again). All in all, it’s been a decent month and just as I had wanted it too, it’s been my favourite so far this year. My main motive for this month was to just be happy and to be honest, I really actually have been. I’ve been spending a lot of time thinking about what I want in my life and making changes to improve it. I’ve made some lovely new friends whom I get along with so well! I also feel like now I’m doing more of what makes me happy my life is generally drama free. It’s been an easy month, one of which I’ve enjoyed a lot. I’ve not managed to go to the gym every week as I had to take 1 weeks off due to illness. However, I’ve been eating as healthy as possible and generally just trying to keep as fit and healthy even when I’ve been so unwell! My course is underway, it’s challenging and hard work but I love how motivated it makes me and how happy I am to be doing a masters. I love education and furthering my education really does make me feel like I’m bettering myself and to be honest, I love improving my own life. It’s been a lovely month and I’ve really enjoyed myself so I’m hoping November will be just as fantastic. September has come and gone, I feel like this year has flown by. What happened to January 2017? I’m bringing back the monthly favourites because they’re my all time favourite posts to read and I love sharing with you guys what I’ve been enjoying throughout the month. I’ve got some fantastic new things to share with you that I have been loving during September! Firstly, Rimmel released some liquid lipsticks that I just couldn’t wait to get my hands on! My favourite is the shade coral sass which is essentially an orange toned red shade which I absolutely love on myself. It’s kind of a summery shade but to be honest, I’ll still be wearing throughout the autumn/winter months. They’re so incredibly light weight and dry super fast without making your lips feel dry and chapped. 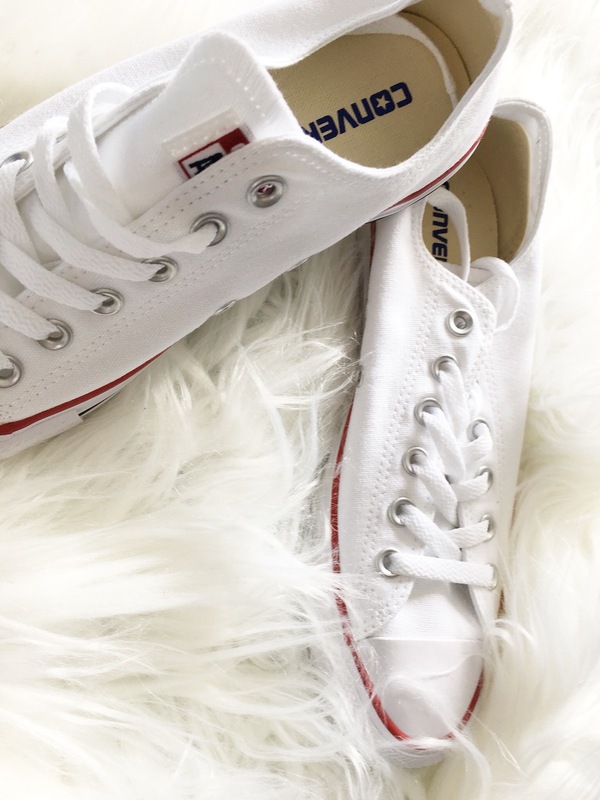 Converse are a statement shoe in my wardrobe and I especially love them for nights out since they are so comfortable but also can make any outfit look fab. Whether you’re dressing down or dressing up, converse just don’t seem to make an outfit look bad. I bought a white pair (I’m silly, I know I’ll get them dirty eventually) and I’ve been living in them. If you’re a student like I am, you can get 10% off when you purchase any item from schuch which is where I bought mine from. This will be the second time I’ve mentioned this jacket on my blog but I just can’t help it. I purchased a suede biker jacket from New Look last month and I honestly thought it was the biggest mistake and that I wouldn’t ever wear it since I didn’t know how to dress it. However, I was wrong and this jacket as become my absolute go to! I’ve been loving it. I’ll wear it with a pair of jeans, boots and a white top or even with a skirt, cami and converse for nights out. It’s become a statement jacket that I couldn’t live without. Since moving back to uni green tea is all I drink (other than wine..). My current favourites are mint, along with apple and cucumber! They’re so refreshing to drink and really help to detox your body, especially after a heavy weekend of drinking. I’ve been regularly going to the gym to workout and I never ever thought I would enjoy going but I just love how it’s been making me feel. I’m so much more energetic and lively now I’ve been regularly working out! An hour a day in the gym and a 15 minute session of yoga really does make the world of difference. I’m a totally different person! Honestly, I don’t think I could stop going now. I picked up a big at the end of the month and actually felt so guilty for not going to the gym! Although I knew my body needed a rest so that’s what I did. I finally watched Wonder Woman for the first time and I’ve not enjoyed a film more this year! She was so badass, empowering and bloody gorgeous! The film really was one of the best I’ve seen this year and I can’t wait to watch her in Justice League. Lastly, the TV show Victoria returned for season 2 and I have been obsessed! I really enjoyed season 1 and I anticipated the return for season 2 and it was totally worth the wait. I love the drama and the history of the show. It really makes you think about the way their lives are as a royal family. These are my September favourites! Let me know some of yours in the comments and maybe I’ll try them out during October. At the beginning of the month I posted my August goals as a test to see whether I actually committ to them. I’m so happy to say that it actually does help motivate me and I really enjoyed keeping to them this month. Along with my August goals I’ve spent all month working and planning to go to uni next month and I’m so excited for it. So, did I achieve all my goals? I did happen to achieve losing 7lb, in fact I lost over 7lb and hit the first 1 stone mark. I hadn’t anticipated to lose weight so fast but I’m glad I have been because now I have lose another 7lb or more before heading to uni. I did save money! I wanted to save between £50-£100 but I saved more than that. I had a rather large deposit to pay for my flat and I was so afraid of not having the money so I literally spent the whole month doing nothing so I could afford it. My nails didn’t grow. In fact no matter how hard I tried, they would snap. Do you guys have any tips on how to grow your nails? Let me know in the comments. Now, for the big one.. did I finish the Harry Potter books? Well.. I almost finished the Harry Potter books. I currently have 1 more to go before I’m totally finished but I feel like reading all 7 Harry Potter books in almost 2 months is an achievement in itself. May is over.. Summer is near and this will be my final monthly favourites until my return this September and I’ll upload a September favourites in October. I’ve had a really chill month, I finished my degree and I went home for a few days and I’ve really just enjoyed relaxing. I think that’s what I’ve loved most about May, the time I’ve had to just enjoy my achievements. Throughout the month I’ve had some pretty exciting things happen. The biggest being, I submitted my dissertation and I’ve finally finished my degree! It’s been an eventful 3 years but I’ve loved my time in Aberystwyth and I’m sure I’ll continue to love it when I return in a few months time. I also went to an awards ceremony for the societies in Aberystwyth University and I received 3rd place for Societies Personality of the Year as well as receiving my Full Colours which are both wonderful and incredible achievements. However, the things I’ve mostly loved this month are actually a few beauty/makeup related things. Firstly, DEWY SKIN! I’ve brought it back and I love it. I’ve been using less power and embracing a bit of a more dewy and fresh look instead of matte and I’ve loved it. I feel so summery and just a bit more glowing. It’s really pretty and flatters my skin a lot. I’ll probably be doing this for the rest of the summer. The Too Faced Sweet Peach palette has been my go-to palette since I received it on my birthday last month. Matts parents bought me it and I love it. 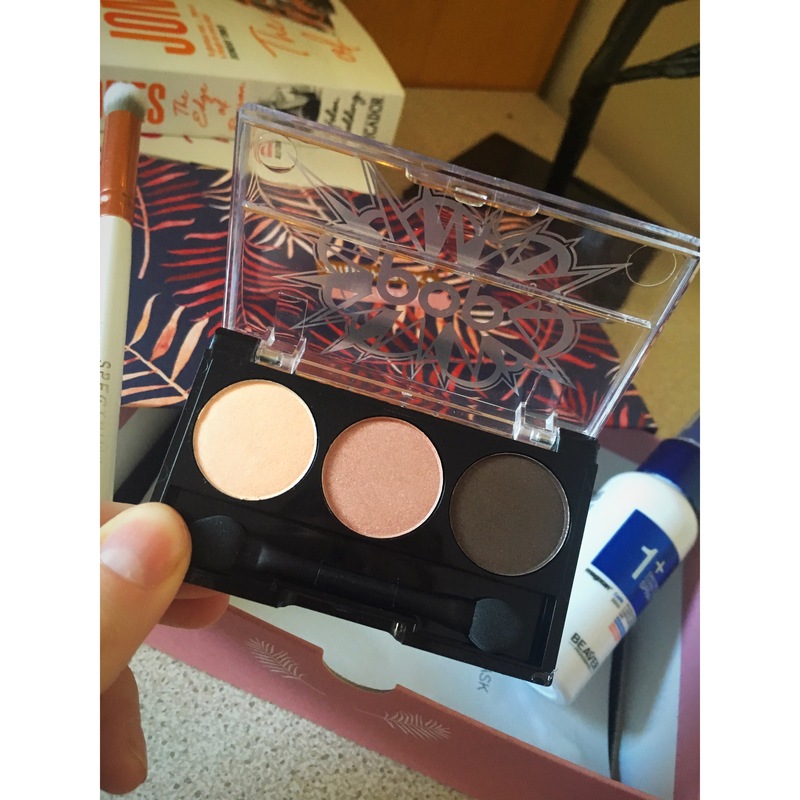 It’s the ideal palette for summer/spring and has the most gorgeous pink tones which I love. I use this non-stop and I’m very happy with it. I’ve been using the L’Oreal True Match foundation and I forgot how good it really is. It’s beautiful on the skin and I use this product to create my dewy looks and I cant fault it. The formula is outstanding and it doesn’t even look drugstore at all. Totally recommend! I also purchased a liquid highlight and I’m still testing it out, it’s the Maybelline Master Strobing liquid in light. I use it on the high points of my face and the pink tones just make my skin look beautiful. I like that it’s not sticky too! I’ve been testing out cream contour and although I can’t say I’ve mastered it I do like the look it gives. My makeup looks totally natural when I cream contour but the best bit is that it doesn’t feel heavy on the skin. Also on this list, the Freedom Brow Pomade. THIS STUFF. For only £5 it’s an absolute bargain, I wouldn’t know as I’ve never tried to ABH brow pomade but apparently it’s a dupe but for the fraction of the price. I’ve also been loving my minimal/no makeup days. Since I haven’t been going many places I haven’t seen the need to put a full face of makeup on. So if I’m just popping to the supermarket or to sit on the beach, I’ll basically just use skincare and the L’Oreal Lumi Maqiue primer and my skin just tools really fresh and glowy. In my April 2017 BirchBox I said that it would be my last until October. Little did I know, my payment went out and the May 2017 box arrived. I’m not complaining as it’s a nice little treat but I did unsubscribe from BirchBox and it sort of irritated me that they didn’t follow through. So, now I have cancelled the direct debit, this is my final BirchBox unboxing until I return in October. I will admit, this months box really isn’t my favourite ever and I’m probably least interested in these products more than any. Hopefully they will surprise me. However, I love the packaging of this months box. It’s a marble looking box and it’s just gorgeous, in fact I think I’m going to keep this to store things in. 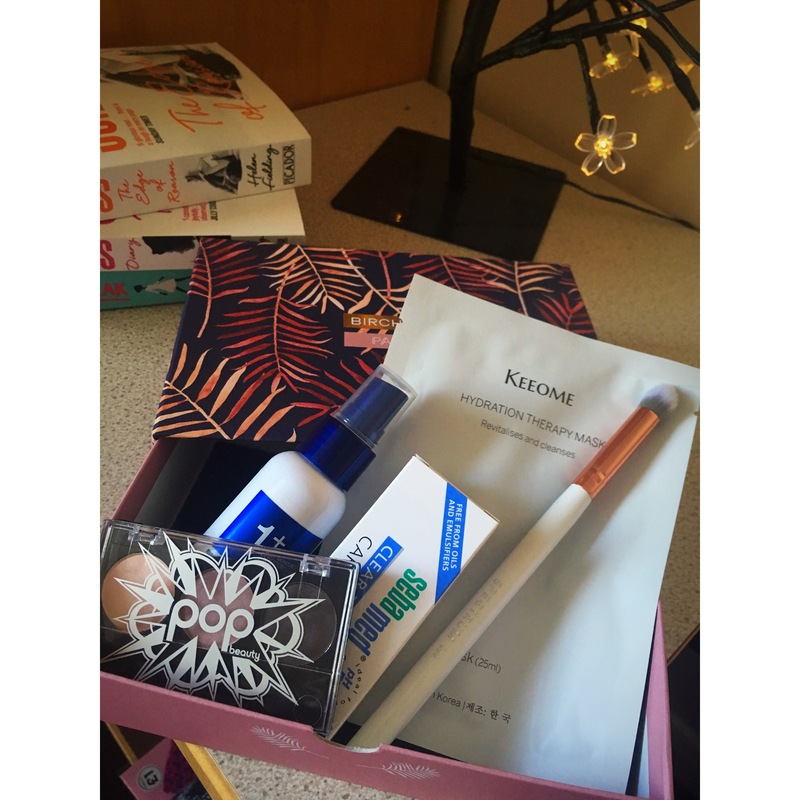 This months box gives us two full sized products which is lovely. The first is the Marsk Mineral Eyeshadow in Vanilla Frosting. This product retails at £14.49 full sized. I like this product 1. because you get your moneys worth for the box from this product alone and 2. because it actually looks like it would be a lovely highlight as well as eyeshadow. I actually don’t own anything like this so I’m probably most excited about this product than any other in the box. I also got the SKIN79 Clean-on 2 Step Nose Pack (full sized) which retails at £2.90 which iS crazy affordable. This product is supposed to de-clog your pores and just refresh your skin. Another makeup item that I received is the Doucce Punk Volumizer Mascara which retails at £18 full sized. I’m always keen to try new mascaras and this is suppose to add volume and thickness which is good since I do have quite thin eyelashes. I received the Whish Firming Body Cream. This product is £27 full sized and is super good as the brand doesn’t test on animals. It’s supposed to protect and soften skin which is good but it’s essentially a moisturiser. Finally, the product that I’m least enthusiastic about is the Kueshi Hair Mask Shine and Volume which is £10.50 for a full product. It’s a basic, simple hair mask but because my hair is so thick I find that these types of products just cling to every strand of hair and does take ages to remove. There we finally have the last unboxing. Enjoy! My March BirchBox arrived rather late this month, therefore my review on it had to be late, super sorry! However, it’s arrived and I’m really looking forward to digging into these wonderful products. This month (and some other months) we’ve been able to choose one of the items that goes into the box. This month it happened to be one of the new Benefit They’re Real lipsticks and lipliners. I chose mine in the shade Lusty Rose as it seemed like the shade I would wear more often. It’s a very pretty, mauve shade and it looks beautiful with so many looks. Since the box arrived I have not stopped wearing it but I’m still unsure whether I love it. I definitely enjoy the colour and creamy formula but it just feels so heavy on my lips and if I’m paying attention to it and sometimes I can’t help but pay attention to it, I find that it really irritates me. These lipsticks retail at £16.50 full sized. Next is the Batiste Dry Shampoo and Conditioner. I’ve been having a love affair with the Batiste Dry Shampoo for so many years now and I will always go back to it for a dry shampoo. I find that it works brilliantly, it isn’t bad for the price and the scents are gorgeous and really help the texture of my hair when I don’t feel like washing it. I’ve used this a few times and I do see a difference with this product in comparison to the original dry shampoo, I just find that my hair different with it rather than the original. Don’t get me wrong, I still love my dry shampoo from Batiste but I think this may be a new love of mine. This is a newly released product from Batiste (I could be wrong but I don’t think I am) and retails at £4.49 full sized which is around the same price some of the other dry shampoo’s from the brand. I’ve never tried anything from the brand BalanceMe so when I received the Instant Lift Primer I was immediately excited. I love trying new primer’s and seeing what works for me and what doesn’t. This primer is supposed to help pores disappear and by using ingredients such as hyaluronic acid and acacia gum, it tightens and smooths the skin to create the ideal complexion. I have tried this already but I don’t feel like I’ve tried it enough to give a proper review. I also think the sample size is far too small and has very little product in it that I may only have 2 or possibly 3 portions left. This then means that I have to head out and buy the full sized product, which is £22 to see whether I really do like it. I also received the Marcelle Gentle Makeup Remover for Sensitive Eyes, this retails at £14.50 and is a BirchBox exclusive. This is probably the product that I am least excited about, I often just use my normal skincare routine to remove my eye makeup and that works absolutely fine. I never go out of my way to purchase an eye makeup remover simply because I don’t think it’s worth the money and I don’t find any micellar water’s irritate my eyes at all. However, it’s a nice treat to have and I’ll take full advantage since I have it and hope that I don’t enjoy it too much because £14.50 for a eye makeup remover is a little pricey. Lastly, I received the Rituals Sensational Foaming Shower Gel. I received the Rituals Magic Touch Body Cream in my October BichBox and loved it, it was incredible on my skin and made my skin feel really hydrated and refreshed. Since I’ve already tried something from this brand it has definitely made me look more forward to trying this shower gel.and it’s a foam which I find so much to play with! Let me know what you had in your box this month. BirchBox’s are my favourite thing. Some months they’re brilliant and other months they aren’t as good, but February 2017 has smashed it. I’m so excited to share with you guys what fun and exciting products I got this month. Let’s jump straight into it! For those who don’t know what BirchBox is, well it’s a monthly beauty subscription that deliver your box to you. It has 5 products each month whether it’s makeup, hair or skincare. Normally you receive 1 full sized products and then 4 small samples or depending on the occasion you may find more than 1 full sized product which is fortunate! This months is a good one and I’ve been so excited to share with you guys what I got. Firstly, the most exciting part of this box is the Sprectrum Collections Marbeleoud C06 Tulip Eye Contour Brush which retails for £5.99 and obviously this is a full sized products. I’ve been wanting to try some of the Spectrum brushes but I’ve always been nervous as some of them are really expensive. However, after having this brush I can definitely say I’ll be purchasing more. It’s so soft it’s unbelievable and the fluffy brush will be perfect for blending eyeshadow. Next fits perfectly with the brush, it’s the Pop Bright Up Your Life Eyeshadow Trio in Champagne Mocha. The three colours are gorgeous and this is probably going to be ideal for those who are starting fresh with makeup. So very excited to try this product. The full size of these shadows retails at £15.50. For hair care I was given the Beaver Professional Daily Moisture Conditioning Spray which retails at £21 for a full sized bottle. If I’m honest, generally I like to use minimal products on my hair as I find that it becomes greasy if I use too many. However, I do have quite frazzled tips so I’m exicted to try this product out and see if it makes any difference the condition of my tips. It does say to use this on damp hair and as I only was my hair a few times a week I’m assuming it won’t make my hair greasy. So we’ll just see! Next I got the Sebamed Clear Face Care Gel which retails at £5.69 full size. This is specially designed to target acne to heal without drying out the skin. I do have acne prone skin so I was extremely happy about receiving this! It’s always nice to try new products which may help my troubled skin. This is also full of hydulronic acid which is great to moisturise dehydrated skin. Finally, the last and full size product is the keeome Hydration Mask Therapy which retails at £29 for 6 masks, usually they’re £66 which is so expensive. I’m really hoping i dislike this mask simply because I’ll probably have to sell a limb just to afford them! However, it says that this helps to revitalise the skin in 25 minutes. At the moment my skin is so dry and I’m hoping this will help just to make it feel more alive again. I’m so pleased with this months box! I love receiving these every month. Let me know what you got.